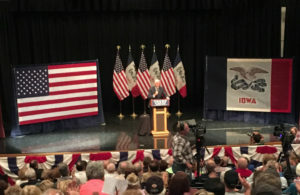 GOP vice presidential nominee Mike Pence spoke to about 200 people in Newton this afternoon, repeatedly getting standing ovations as he praised his running mate Donald Trump. Iowa Congressman Steve King delivered the same message to the crowd as the warm-up speaker for Pence. King is “all in” for Trump and he declared Trump the winner of Sunday’s “prize fight” debate with Hillary Clinton. King criticized House Speaker Paul Ryan — the Wisconsin Republican — for saying on Monday that he will no longer defend Trump. Pence did not mention his former House colleague during appearance in Newton. A woman named Rhonda told Pence she’s worried about voter fraud. “If Hillary Clinton gets in, I myself, I’m ready for a revolution because we can’t have her in,” she said. A few in the crowd clapped. Pence left Newton and headed to Davenport where he was to speak at the Scott County Republican Party’s annual fundraiser. Arkansas Senator Tom Cotton is also headlining the event, which often has served as a proving ground for presidential candidates of the future. Missouri Senator Claire McCaskill campaigned into Iowa today on behalf of Hillary Clinton. McCaskill said she doesn’t think Americans “are going to elect someone who brags about groping women” as their president.